Rotator cuff surgery is a common sports injury surgery. Rotator cuff tears can occur with many different sports but are most common with overhead athletes like pitchers or other throwers. Most rotator cuff injuries will be treated conservatively in their early stages. Surgery is the last resort treatment and requires an extensive rehabilitation period in order to return to full pain free function. Rotator cuff surgery involves either a repair or debridement of the rotator cuff tissues. Depending on the extent of the tear, this surgery can be performed either arthroscopically or as an open procedure. The most common test to have before surgery is an MRI. This test gives a good picture as to the extent of the damage to the rotator cuff. An MRI will show where the tear is located, and may be able to determine if an arthroscopic or open procedure is required. However, even MRI's can be misleading and your surgeon will not know the full extent of the injury until they get inside your shoulder. The first part of rotator cuff surgery is a diagnostic arthroscopy. This allows the surgeon to evaluate the rotator cuff and the type of tear you have. 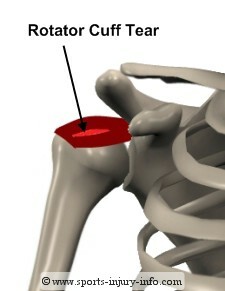 Rotator cuff tears are classified as either partial or full thickness tears. Partial thickness tears mean that the "hole" in the rotator cuff does not go all the way through from the top to the bottom of the tendon. Full thickness tears go all the way through the tendon. 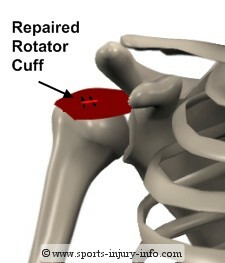 Using the arthroscope and a small probe your surgeon can look inside your shoulder and evaluate the rotator cuff tear. They can determine if the tear is a full or partial tear, and how large the tear is. The smaller the tear, the easier it is to repair. Small tears can be treated arthroscopically, while larger tears usually require an open procedure. The first step in repairing the rotator cuff is to debride the tissue. This means cleaning up the torn tissue and removing any damage. Think about the rotator cuff tendon like a piece of rope. When there is wear and tear the rope starts to fray. The frayed areas need to be trimmed down to good, healthy tissue. Once the debridement is complete, the rotator cuff can be sutured back together. 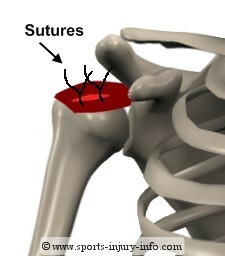 Your surgeon will place small sutures in the rotator cuff to pull the torn tissues back together. Depending on where the tear is, they may also need to use an anchor to reattach the tendon to the bone. Large tears or tears that have retracted away from the bone may require an open procedure. Once the sutures are placed in the rotator cuff, they are tied together to pull the tissue back in place and close the tear in the tendon. Your sutures may be absorbable or they may be permanent. After the rotator cuff is repaired, your surgeon will close your incisions with sutures or staples, and you will be placed in a sling and sent to recovery. Following rotator cuff surgery, you will be in a sling for several weeks. This is very important to allow for the repaired rotator cuff to heal. The most important thing to avoid is active motion of your arm and shoulder. Any active use of the arm will cause the rotator cuff to contract and this can place unwanted stress on the repair. Some physicians will wait several weeks before having you start rehab. While this will help to prevent disrupting the repair, I have found that patients who start rehabilitation early do much better with their rehab and recovery. I regularly see patients 2-3 days after surgery. We do not work on active strengthening, but passive range of motion and pain control help to get their rehabilitation off on the right foot. Talk to your physician about when you should start rehabilitation. Earlier is usually better, as long as you follow the post-operative instructions and avoid active motion. After rotator cuff surgery, you will be in a sling for 4-6 weeks. During this time you will not be able to actively use your arm. You can work on passive range of motion to tolerance under the direction of your athletic trainer or physical therapist. 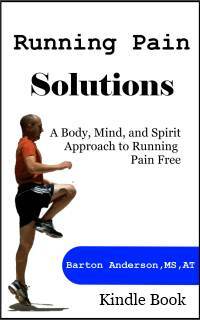 You can also work on strengthening of the scapular stabilizers and working to decrease your pain. Once you are 4-6 weeks out from surgery, assisted range of motion exercises and light strengthening can begin. Full recovery from rotator cuff surgery usually takes 4-6 months for most people. During this time you will be working on restoring normal strength, range of motion, and control of your shoulder. For overhead throwers, full recovery will take longer, as long as 6-12 months depending on your level of activity. Rotator cuff surgery is effective in treating a torn rotator cuff. This procedure can be performed arthroscopically or as an open procedure depending on the extent of the tear and your surgeon's skill. 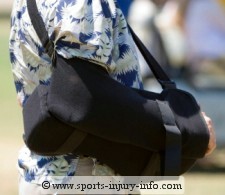 You will be in a sling for several weeks, and a full recovery will take 4-6 months, longer for overhead athletes. Rehabilitation following surgery is essential to restore normal shoulder function.